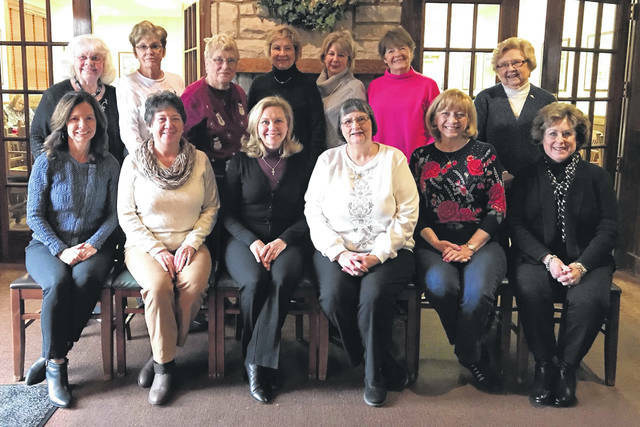 Health Alliance of Clinton County officers and board members are, from left: seated, Louanne Blumberg, Cindy Petrich, Kathy Havey, Mary Camp, Pat Richardson and Ann Johnson; standing, Jennifer Hollon, Susan Kocher, Nancy Bernard, Linda Custis, Patti Cook, Betty Lou Germann and Frances Sharp. Not pictured are Sharon Johnson, Bobbi Jo Schlaegel and Jane Bosworth. WILMINGTON — The Health Alliance of Clinton County officers and board members recently held their annual retreat at Damon’s restaurant. A warm welcome and “Happy New Year!” was given by President Kathy Havey, who thanked all of the members for their hard work in 2018. The events of 2018 — including the jewelry and book sales, the April Fool’s 5K and the Holiday Ball — were very successful. The fundraisers helped the HACC to achieve their mission of financially assisting the health care needs in our community. Havey welcomed the new board members, Nancy Bernard and Linda Custis. The officers for 2019 include Kathy Havey, President; Cindy Petrich, Vice President, Pat Richardson, Treasurer; Bobbi Schlaegel, Assistant Treasurer; Mary Camp, Secretary; Sharon Johnson, Assistant Secretary; and Louanne Blumberg, Past President. The general meeting dates and event dates for 2019 were distributed. The business meeting reports were given by the officers and event chairpersons. Pat King, director of the Cancer Patient Assistance Program (CPAP), thanked the Health Alliance for their fundraising efforts of 2018. She then proceeded with a presentation on patient needs. She indicated that CPAP has served approximately 377 patients with various health care needs. Pat has unending gratitude for the health alliance contributions and the CPAP group. All members are looking forward to working together in the new year.